When mixing this batter you can use a blender or whisk together in a large bowl. Refrigerate atleast 30 minutes. It can be made up to 2 days ahead. The batter should be thin, like the consistency of cream. You may need to add water if it is too thick. 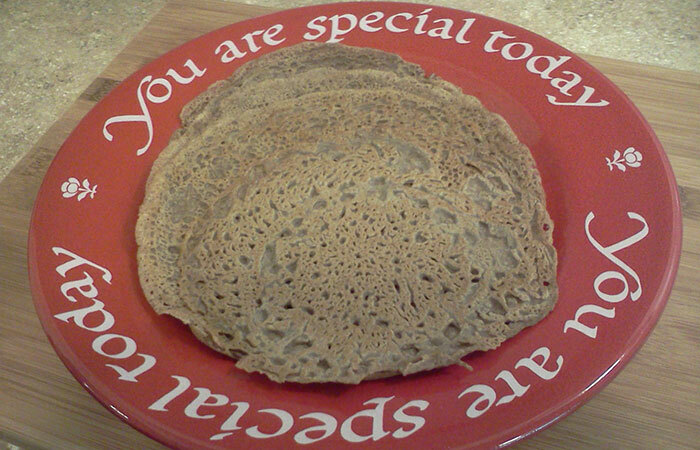 Use an 8″ non stick pan or if you have a crepe pan. Heat the pan on Med.High, wipe pan with paper towel soaked with butter. Do not use too much butter on the pan. Use a 1/4 c measuring cup as a scoop, it is the perfect size. Pour into the middle of the pan and roll the batter around to make a complete circle. Cook for 30 seconds to 1 minute. Flip and cook another 20-30 seconds. Slide onto plate. These stack well and do not stick. I like to keep my fillings simple. I put Sunflower Butter and Jelly in my crepes. Whipped cream ( homemade, no canned stuff) Drizzle with Maple Syrup. Plain Yogurt with Maple Syrup drizzle, Homemade Nutella, or Pineapple Salsa, or any chopped fruit or veggie of your choice. I like these crepes just plain as well! You can also use the Quinoa stuffing from the Portobello mushroom recipe. Use these crepes instead of tortillas and make tacos!